From humble beginnings where teams wore different strips only to tell themselves apart, today football kits have become a huge revenue opportunity for clubs and sportswear manufactures. Over the last twenty years, these once basic uniforms have morphed into a grotesque fashion accessory, designed not for the footballer, but for ardent fans willing to pay for their slightly modified designs year after year. The same is true of the national team, whose strip is refreshed every two years in the same evolutionary way, adding and rearranging design elements that typically result in forgettable designs. This desire to appeal to the consumer rather than the football player is perhaps best symbolised by the infamous grey ‘Away’ kit worn by the England team during Euro 96. Abandoning the traditional bright red strip, it was replaced with a bluish-grey coloured edition apparently designed to compliment denim jeans. Yet on the pitch it had the effect of making players harder to pick out, and arguably contributed to England’s defeat to Germany in the semi-finals. With this in mind, I imagined the 2009-11 kit to be in much the same vein, perhaps reflecting the current trend for eighties retro-styled fashion (and no doubt bringing with it horrible memories of Kevin Keegan’s perm and Chris Waddle’s mullet). Instead designer Aitor Thrope has gone with a far more classical look, and a design inspired by kits from the 1950’s. 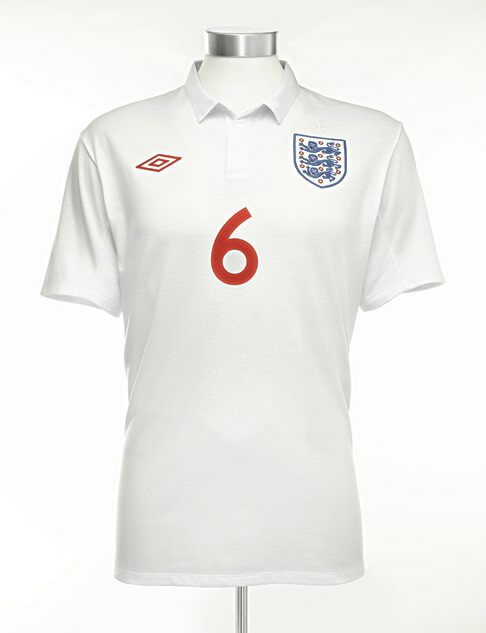 This has returned the strip to a far simpler, brilliant white design, one no longer adorned with a stylised St George Cross or other unnecessary trimming. The star representing England’s solitary 1966 Word Cup win remains, but now shares the same colour as the shirt, giving it a far more modest feel—a wise choice given our recent lack of success in that competition. I really admire the braveness of this new design, one which is clearly revolutionary rather than evolutionary. Whilst I’m sure the design is still targeted at the consumer, perhaps it’s telling that the new shirts will be custom tailored for each player. 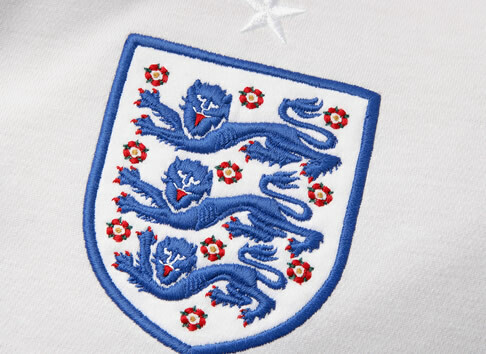 With a design that harks back to a more respectful age, let’s hope it will remind players to perform to the standard expected of them, those few who have the rare opportunity to wear the three lions and play for England. Early indications look positive. You can learn more about the new kit at umbro.com.